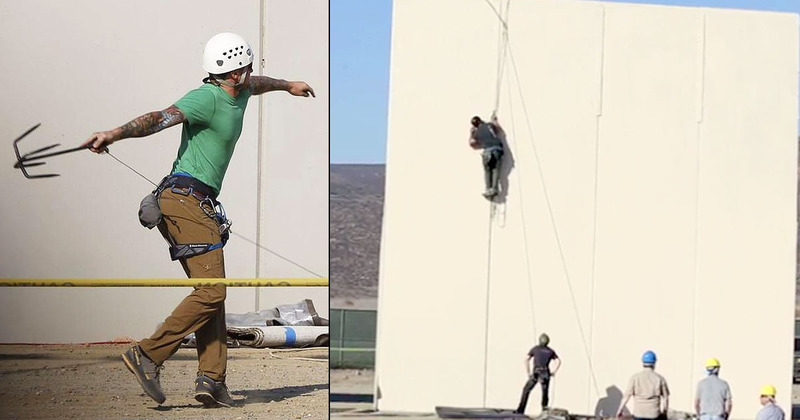 The reports are that military tactical teams have been testing the border wall prototypes constructed in the California Desert over the past three weeks and have determined which characteristics of the designs provided them with the most difficulty in defeating. That type of testing is a great idea and it is said to have involved the use of jackhammers, saws, torches, and other tools and climbing devices. The report indicates that, while no particular prototype was endorsed, the most effective features were. The Los Angeles times reports that on only one occasion was a tester able to successfully land a hook on top of the wall without help. They don’t say whether there were other instances where they were successful with help and there’s no shortage of bad guys willing to work together to ply their trades, so that is an important distinction that needs to be considered. They spoke favorably of the tube-top design for repelling climbing devices, but say it’s not appropriate for mountainous areas due to their jagged terrain. They also endorse the use of gapped steel uprights at ground level because it allows a view of what is taking place on the other side and is more easily repaired. While they acknowledge that “topping the steel with smooth concrete surfaces helps prevent climbing,” there does seem to be a flaw to the untrained, lay observer that surely the experts have thought through and merely didn’t report on. For the sake of discussion, it does seem that a bad guy could simply attach a hook or other lead to a rope, cable or strap and toss or otherwise project it the thirty feet over the wall, perhaps by drone, and then use a second hook, not unlike a golf ball retriever, to draw the original hook and strap through the gaps in the fence. That would create a full circle which could be drawn tight, secured in place to prevent slipping, and used to climb up the wall and then to lower the bad guy to the ground on the other side. It seems like a one-man operation although a team of two or three might make it quicker and more practical from the smuggler and terrorists’ perspective. While it’s understandable that gaps in the fencing serve a purpose, they also seem to provide an easy means for diminishing the integrity of the wall or fence. While any of the structures will serve as a serious impediment, particularly to human trafficking, the cartels have proven themselves to be quite adept at defeating our security in the past. Perhaps a solid concrete structure, with protected camera pods for surveillance, offers a more reliable, albeit more expensive, means of keeping the bad guys out. Maybe the use of thick reinforced Plexiglas in panels between narrow metal uprights, if found to be strong enough, would serve the purpose of a solid barrier while still providing the visual advantages. There would be the issue of cleaning them periodically so perhaps some form of reinforced metal screen between uprights would make more sense, eliminating the need for cleaning while still preventing the situation addressed above. Of course no system is perfect and none of them eliminates the use of tall ladders or incorporate razor wire at the top in their current forms. Perhaps a horizontally undulating surface would provide a less stable surface for a ladder to be positioned against than the smooth surfaces in the test structures. One way or another ridding this nation of the threats posed by Mexican cartels, squatters and terrorists has to become a reality. Keeping them out for good by making sure the fencing is effective, not just imposing, needs to be a vital component of that process. As crazy as it might sound, it wouldn’t be a bad idea to ask some “reformed” cartel members for their input, before we start construction, just to see what they would try to do to get across the designs. They could really go out on a limb and open the process up to comments by the American people. A war with Mexico is long overdue. The best people to ask and the best design would be the Israelis. Summarily shoot anyone who goes over the top. If they did that, there would be way fewer people trying to climb over it. A wide trench filled with dead illegals would also serve as a deterrent, especially if it was well populated with live cobras and crocodiles. Many readers are writing suggestions for defeating all the design vulnerabilities. Let’s hope their suggestions are being monitored and considered. Any structure can be overcome, and criminals have great imagination when it comes to getting around stops. 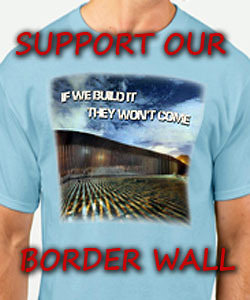 IMO, the wall will only stop the foot traffic that streams across. “Troops”, motion censors attached to laser guided sniper rifles and alerts, and heat censors for tunnels, attached to bunker busters might get most of it. 500 Feet of landmines works, too. A machinegun tower, every 1/2 mile, would slow the flow, as well. We have the means, just not the determination, yet. anything that man makes can be DEFEATED. just hope they take advice from those who has been on the others side to see HOW they would defeat any border defenses?